This system has two quality housings and fits under the sink. The cartridges are included and will filter sediment and reduce tastes and odours including chlorine smells. A chrome tap and fittings for mounting on a sink are included. A pressure limiting value comes as part of the system. 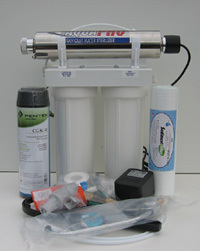 This system includes an Aquapro UV sterilizer that will greatly reduce bacteria levels if present. The output is approximately 4.5 l / minute.